I first stumbled on Canada's No Joy in 2013 in the unusual location of Spanish breakfast radio by the hypnotic 'E', drawn in by Jasamine's White-Gluz's dreamy vocal fighting for space with walls of guitar-drenched noise. This pattern was neatly replicated on their subsequent albums Wait For Pleasure and More Faithful, both of which more or less maintained the template. 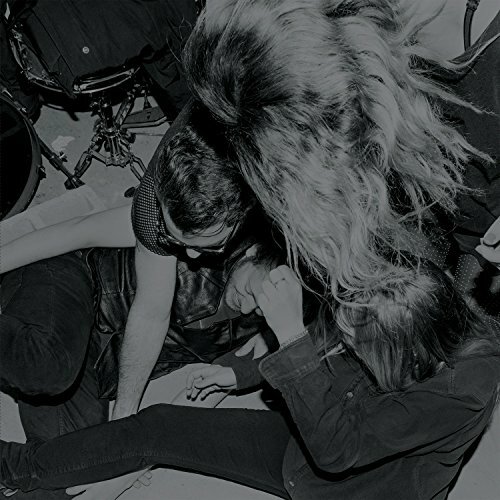 Following up from last year's Drool Sucker EP, No Joy have started to forge beyond their set boundaries and with the Creep EP, have set their experimentation bar high with just four tracks that cram so much in that each listen seems to produce a completely different aural experience. A joy from beginning to end. Opener 'Califone' is a breezy, positive opener, as busy 'chugging' guitars lead initially into swirling noise, with a slightly 'unclean' disortion helping provide texture and depth to the track. Jasamine's dreamy vocals, with a nod to Sonya Aurora Madan or Beth Thompson in pitch and presence, are complemented by pattered drums and luscious collapsing guitar and bass hooks. Never sitting still for long, different layers of guitar noise are regularly applied working best near the close as Jasamine's high-end vocals soar and swoop over the top of the instrumentation. Electronic samples fight their ground with regular drums and fuzzier guitars on 'Hellhole' akin to early 90s Bang Bang Machine. The song then drops into almost metal riffing and a sassy drum structure, with gorgeous, barely-audible vocals throughout. More recent output from Medicine springs to mind, but this is more in control and much better for it. A heavier tune but a good proportionality of density is maintained. 'Tearing Apart The Dark' again demonstrates a Zappa-esque mix of clash of styles along with Gorky's Zygotic Mynci changes in tempo and aura throughout, shifting from blissful moments of dream pop into dirty metal riffs that envelop the room. A male vocal veers from high-end vulnerability to all out screaming, until Jasamine's serene vocal and chiming guitar appears as a temporary respite before sludgier guitars and frenetic drums bring proceedings to a close. A terrific hotchpotch of a song. Closer 'Fluorescent Dread' explores a different path, as electronic sequenced pulses introduce the track and propel it along throughout. Processed drums, an angelic vocal that drifts in and out and various sampled noises appear, like the band have unearthed Disco Inferno's arsenal and only used the factory settings. The processed keys possess a bit of a John Carpenter vibe, albeit set in Studio 54 rather than post-Apocalyptic New York. With some great explorations on new directions, Creep is a brave EP that doesn't care for a settled identity, but never fails to maintain focus throughout. An exciting, unpredictable addition to No Joy's impressive catalogue. Who knows what they're going to follow this up with!